A new version of the NERIS Strategic Research Agenda (SRA) is now available! The overall goal of a SRA is to provide basis for priorities regarding future research & development needs. It is an instrument for creating synergies, co-operation and coordination internally between the NERIS participants and externally with activities taking place within the European Joint Programming for Radiation Protection Research and within other international forums. The new version of the NERIS SRA has been elaborated during these last 18 months by the NERIS R&D Committee and the NERIS Management Board. Also, consultations with the NERIS Stakeholders have been made during the last NERIS Workshop in Lisbon notably. You can download the new NERIS SRA here. In the framework of CONCERT WP2, NERIS, as other European research platforms, prepared its roadmap with a long-term view and aiming to identify research priorities in emergency and recovery issues. This roadmap also contributes to explore joint interests for multidisciplinary and synergistic research between all research Platforms in radiation protection.  Facing the consequences of a nuclear or radiological major accident or incident: how to optimize society’s preparedness, and short term/long term response?  Facing the threat of a radiological terrorist act: How to minimize consequences? The NERIS roadmap has been elaborated by identifying research priorities in a long-term goal (0-5 years, 6-10 years, > 10 years) and in line with the updated NERIS SRA. This document has been elaborated by the NERIS R&D Committee and the NERIS Management Board during last year. A dedicated consultation meeting, gathering all NERIS stakeholders was held last September in Brussels and allowed to finalize this first version of the document. You can download the first version of the NERIS Roadmap here. The 14th issue of the NERIS Newsletter is now available. This edition provides some feedbacks from recent events as the 3rd NERIS Worskshop as well as the 4th ICRP Symposium and the 2nd ERPW17. The 3rd NERIS Workshop, organised in cooperation with the Institut Superior Tecnico and the Agência Portuguesa do Ambiente, has covered the State of the art and Needs for further research for emergency and recovery preparedness and response. 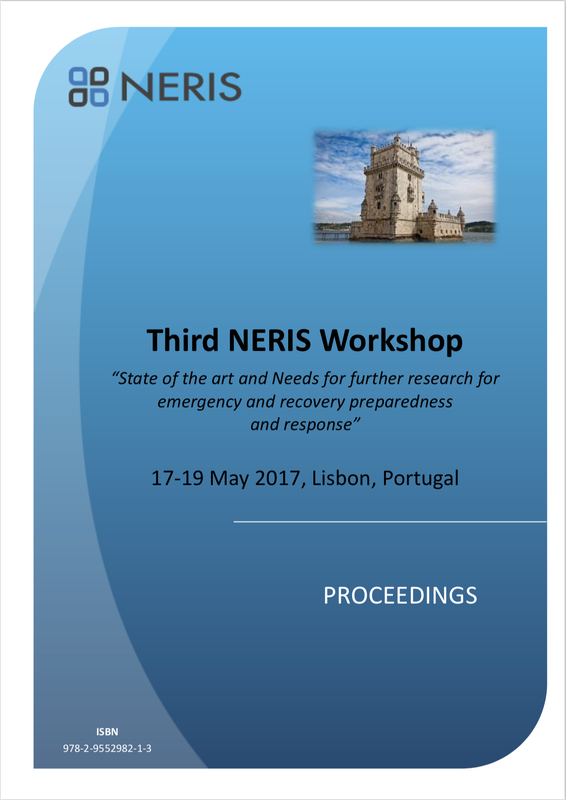 The NERIS Workshop 2017 has provided an opportunity to discuss and exchange with NERIS Members, International organisations and European Research communities on priorities for the NERIS Platform. 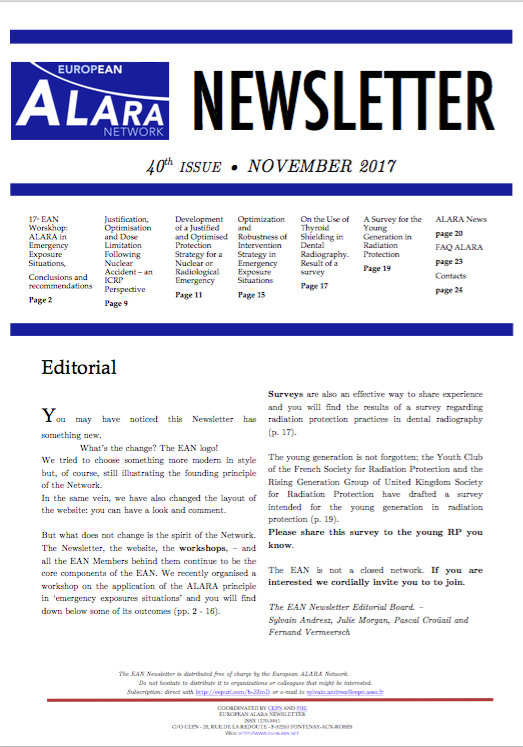 You can access here to the 40th issue of the European ALARA Network Newsletter which deals notably with the Conclusions and Recommendations from the EAN-NERIS Workshop (Lisbon, May 2017) dedicated on the application of ALARA in emergency exposure situations. Since late September 2017, Ruthenium 106 has been detected by several European networks involved in the monitoring of atmospheric radioactive contamination. Ruthenium 106 is a radionuclide of artificial origin. It is a fission product from the nuclear industry. This radionuclide is also used in the medical field for brachytherapy treatments. The very low levels of atmospheric contamination of Ruthenium 106 observed to date by European monitoring networks have no environmental or health consequences in monitored countries. Nevertheless, all European networks maintain a watchful vigilance on this presence of ruthenium in the air.